We closed this position on February 8, 2019. A copy of the associated Position Update report is here. As Snap’s IPO approaches, investors point to Facebook (FB) and Twitter (TWTR) as good comps. A closer look at Snap’s S-1 reveals that Twitter is the only comp that makes sense given Snap’s negative profitability, nosebleed valuation, and questionable disclosure practices. For these reasons and more, Snap Inc. (SNAP) is in the Danger Zone this week. In what began under a shroud of secrecy, Snap (SNAP) filed IPO documents confidentially with the SEC. Many investment banks were denied access to the documents. Snap also threatened to cut underwriters’ fees if confidential information was released without the company’s blessing. What is Snap hiding? If you have good stuff to show the world, wouldn’t you want to show it? Since the release of Snap’s S-1 late Thursday afternoon, the answer to “what is Snap hiding” appears simple: major profit losses. Per Figure 1, Snap’s net operating profit after-tax (NOPAT) fell from -$344 million in 2015 to -$498 million in 2016. Meanwhile, revenue grew from $59 million to $404 million, or 590% over the same time. Not surprising, SNAP’s losses coincide with a highly negative NOPAT margin of -123% and a bottom-quintile return on invested capital (ROIC) of -34%. While still in its early stages, Snap’s expenses are a concern. 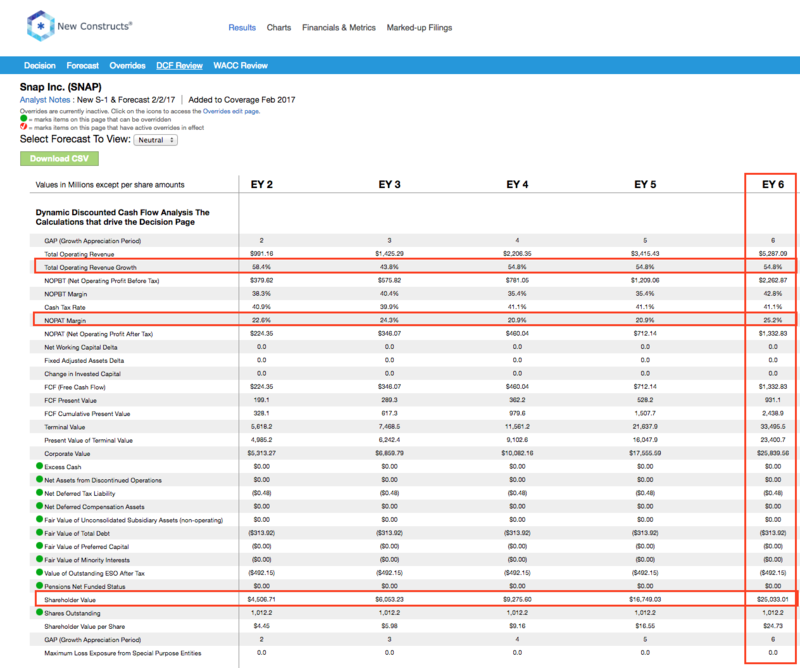 In 2016, the company’s cost of revenue was actually greater than its overall revenue. No matter how many users Snap touts or how fast those users are growing, it’s clear the current business model is no Facebook model. Non-GAAP metrics are a red flag for investors because they often mask the true economics of the business. 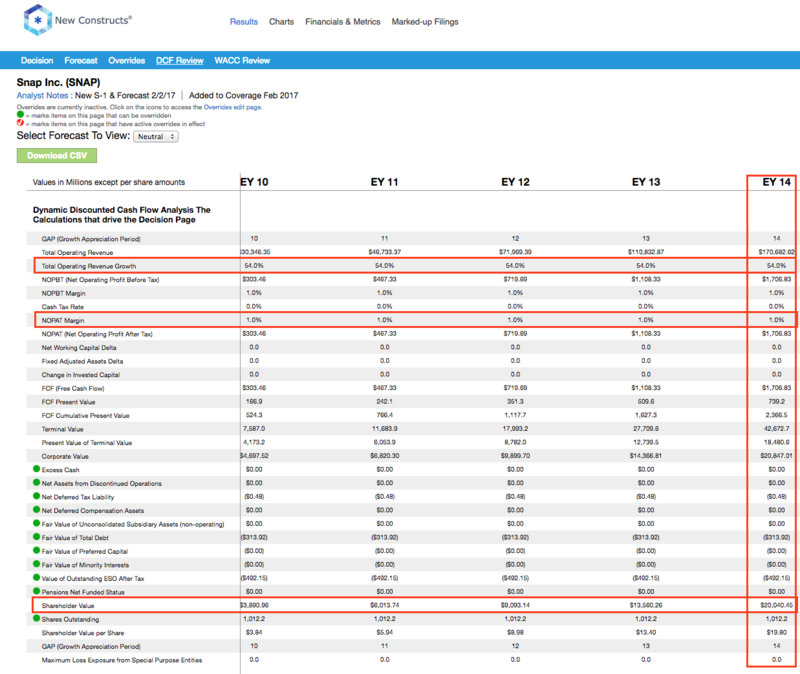 Snap uses adjusted EBITDA in its S-1, but even that metric cannot mask the large losses of the firm. 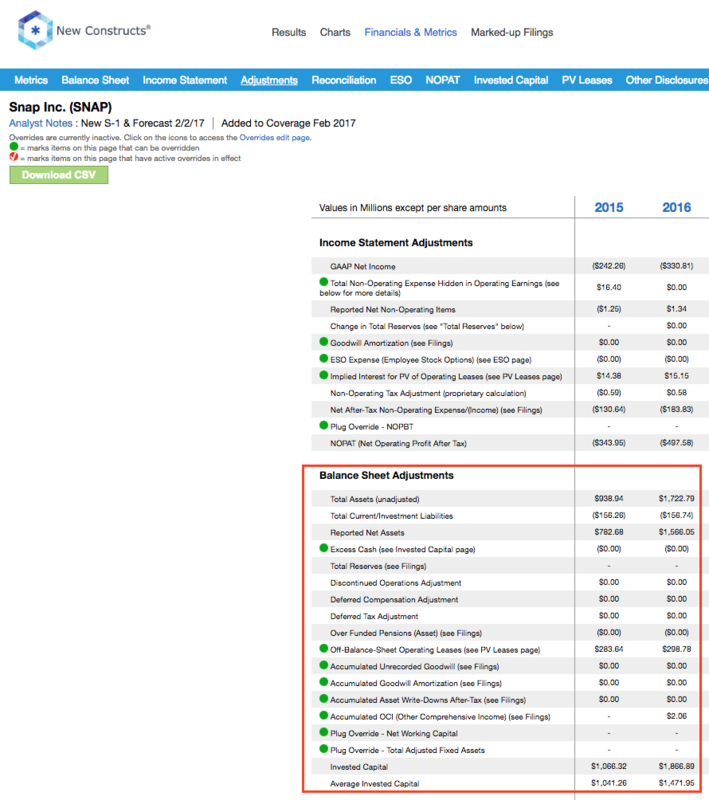 The largest item removed from adjusted EBITDA is stock-based compensation expense. Snap removed $73 million (124% of 2015 revenue) and $32 million (8% of 2016 revenue) in stock-based compensation expense in 2015 and 2016. 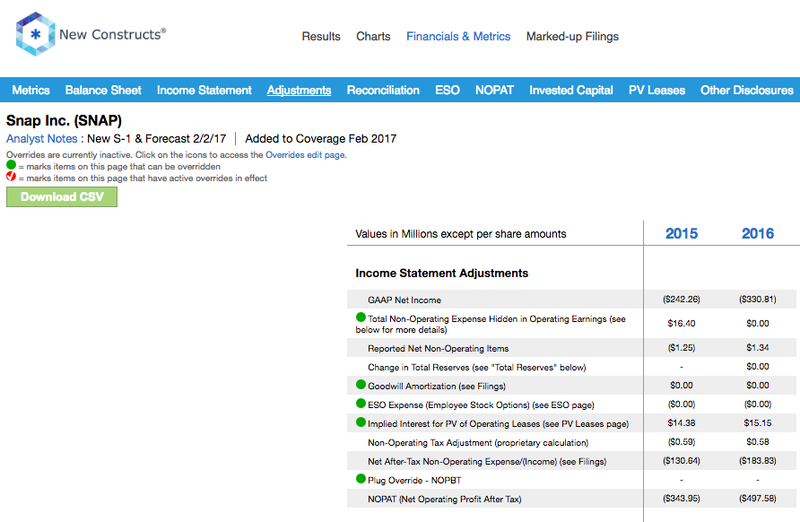 Even after this adjustment, Snap’s adjusted EBITDA was -$459 million in 2016, compared to -$515 million GAAP net income. Nevertheless, we warn investors against trusting that metric even if it does turn positive at some point in the future. Snap management like to pitch the company as the next Facebook, but we think that goal is a lot easier to voice than it is to achieve. Claiming to be the next Facebook is a great way to sell your valuation. In reality, Snap is the next Facebook competitor, which has proven to be fatal for some businesses. Despite Snap’s claims to be a camera company, the firm’s heavy reliance on advertising dollars (96% of 2016 revenue) pits it against some of the largest media/internet firms in the market. Specifically, Snap faces competition from Facebook (FB), Alphabet (GOOGL), Apple (AAPL), Twitter (TWTR), and, if Snap is truly a camera company, GoPro (GPRO). Per Figure 2, Snap’s -123% NOPAT margin places it well below its main competitors. In addition to operating with drastically lower margins, Snap faces an uphill battle in regards to its user base, aka daily active users (DAU). This calculation avoids easy comparison to previous Danger Zone pick Twitter, which discloses monthly active users but not individual DAUs. However, Bloomberg estimates that as of 3Q16, Twitter had 136 million DAUs. Facebook uses DAU to measure its user base and it dwarfs Snap and Twitter, per Figure 3. Facebook’s daily active users reached 1.17 billion in 3Q16 compared to just 153 million for Snap. Through 4Q16, Facebook’s DAUs have grown to 1.22 billion and Snap’s have grown to 158 million. It’s worth noting that Facebook reported 526 million DAUs in the last quarter before it went public. Is Snap more like Twitter rather than Facebook? It would appear Snap shares more similarities with the former than management would like to admit. Investors are always looking for the “next Google” or “next Apple.” In other words, they’re looking for a firm that will disrupt an existing market and greatly reward shareholders along the way as stock prices soar. In Snap’s case, investors are betting on the company becoming the “next Facebook” even though Facebook is one of, if not, the most successful social media companies in the market today. The comparisons to Facebook make some sense. Snap and Facebook each compete for user engagement and must find ways to monetize those users. Furthermore, with Facebook’s acquisition of Instagram, the firms compete directly in the “photo-capture” aspects of mobile applications and social media. For those thinking Snap could be the next Facebook, though, the comparisons stop there. First, when Facebook went public it was a profitable firm. In 2012, Facebook’s NOPAT was $1.1 billion and the company achieved a 21% NOPAT margin. Since then, Facebook has continued to grow its revenue, user base, and improve margins. Second, to become the next Facebook, Snap would ultimately need to take market share from the highly successful incumbent. To take share from Facebook, Snap must either (1) charge less, (2) provide more value for the same or higher price or (3) both. While option one is certainly viable, as Snap directly controls its product pricing, it does little to improve already negative margins. At the same time, engaging in a pricing war with profitable competitors makes it hard to ever believe Snap can reach breakeven. Option 2, provide more value than Facebook ads, seems unlikely in the near-term. Within Snap’s S-1, the company provides the Advertisers Perceptions’ September 2016 Report, which examines advertiser and agency perceptions of different advertising platforms. While Snap ranked first in “satisfaction rating”, it ranked fourth in “Plans to Increase Ad Spend”, behind YouTube, Facebook, and Instagram. If Snap plans to provide greater value, it has yet to convince advertisers as they’re still choosing competing platforms ahead of Snap. Lastly, and most importantly, SNAP’s expected IPO valuation already implies that the firm will grow into the next Facebook. This expectation leaves room for little upside but large downside risk. It’s clear Snap’s unprofitable business is in the early stages of its development. However, we can still model multiple scenarios that quantify the expectations already baked into the firm’s expected $25 billion valuation. The Next Facebook: This scenario implies that Snap is the “next Facebook” and achieves the same high NOPAT margins and revenue growth as Facebook. To justify a $25 billion valuation, Snap would have to grow revenue by 54% compounded annually for the next six years, while immediately achieving & improving NOPAT margin from 21% to 25% in its first four years as a public company. Remember, Snap’s current NOPAT margin is -123%, but this scenario mimics Facebook’s margin improvement and revenue growth since 2012. In this scenario, Snap would be generating $5.3 billion in revenue (six years from now), which is more than double Twitter’s last fiscal year revenue. The Next Twitter: This scenario implies that Snap struggles to achieve profitability like Twitter, which still earns a negative NOPAT margin. To justify a $25 billion valuation in this scenario, Snap must immediately achieve a 1% NOPAT margin and grow revenue by 54% compounded annually for 14 years. In this scenario, Snap would be generating $171 billion in revenue (14 years from now), which is greater than Facebook and Alphabet’s 2016 revenue combined. It’s also worth noting that each of these scenarios assumes SNAP is able to grow revenue and NOPAT/free cash flow without spending on working capital or fixed assets. This assumption is unlikely but allows us to create very optimistic scenarios that demonstrate how high expectations in the current valuation are. For reference, SNAP’s invested capital grew $800 million from 2015-2016. It’s clear to see that the expectations already embedded in SNAP’s valuation are much too high. Ultimately, Snap’s success will be determined by its ability to attract advertising revenue in a highly competitive market. We’ve seen Twitter fail to monetize its user base while Facebook flourishes. At the same time, Facebook continues to grow its user base while Twitter struggles to maintain high user growth rates. With the hype and attention SNAP’s IPO is receiving, the firm will be hard pressed to meet or beat expectations from the get-go. As soon as investors get the idea that Snap is more like Twitter than Facebook, we think SNAP’s current valuation could crater. As an “emerging growth company,” Snap is exempt from standard requirements related to executive compensation. These exemptions include holding advisory votes on executive compensation and providing information regarding the ratio of CEO pay compared to compensation of other employees. These minimized disclosure requirements are a red flag for investors, as they reduce transparency into how executives are incentivized. Additionally, the share structure disadvantages IPO investors. After IPO, Snap will have three share classes. The A shares being sold to the public are entitled to no vote on matters submitted to stockholders. Snap is going public and enjoying the benefits of an IPO (influx of cash) while giving away zero voting power to new investors. Instead, the co-founders of Snap and existing private shareholders will retain all voting power in the newly public company. Income Statement: we made $210 million of adjustments with a net effect of removing $167 million in non-operating income (41% of revenue). We removed $188 million related to non-operating income and $22 million related to non-operating expenses. 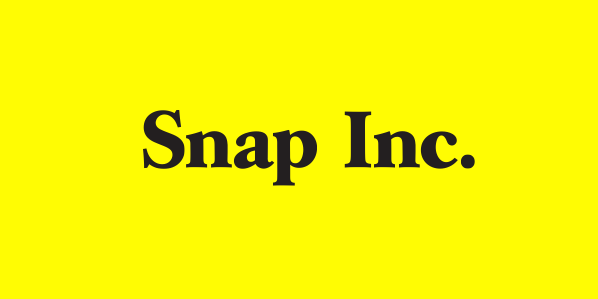 See all the adjustments made to SNAP’s income statement here. Balance Sheet: we made $696 million of adjustments to calculate invested capital with a net decrease of $94 million. The most notable adjustment was $299 million (19% of reported net assets) related to operating leases. See all adjustments to SNAP’s balance sheet here. Valuation: we made $807 million of adjustments with a net effect of decreasing shareholder value by $807 million. There were no adjustments that increased shareholder value. The largest adjustment to shareholder value was $492 million in outstanding employee stock options. This adjustment represents 2% of SNAP’s expected market valuation. This article originally published here on February 6, 2017. Disclosure: David Trainer, Kyle Guske II, and Kyle Martone receive no compensation to write about any specific stock, style, or theme. 4 replies to "Danger Zone: Snap Inc. (SNAP)"
Great analysis using the commonly publicized comparable.